This post is sponsored by Purple and may contain affiliate links but all opinions are my own. I’m so excited that we are finally updating our bedroom! It’s not that I didn’t like what we had before, it’s just that I was ready for a change and wanted a bit of an upgrade. I wanted our color scheme to be mostly gray and white (with some blues eventually) so our dark brown nightstands just wouldn’t due! So… I painted those too! Did you know that you CAN paint laminate? It’s just a bit tricky and not the most wear resistant. These will also go in the basement guest room because I found some really cute and affordable replacements! Alright so on to the reveal! I’ve wanted to upgrade to a king size bed for forever! I have three kids and I love morning cuddle time, so a king bed was a dream of mine! Luckily, I got a chance to partner with Purple and they sent me a king size purple mattress. Let me tell you… I don’t think I’ve anxiously awaited anything more than my Purple mattress. I couldn’t wait for it to arrive! Naturally, you can’t review a king size mattress without a king size bed, right? YES! Finally, I got the excuse I’d been waiting for! It’s time to update our bedroom! Muhahaha…. I’d been thinking about this for quite some time and I’m definitely a planner. 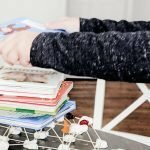 I know the style I like and I know that whatever I have in my house needs to stand up to 3 boys… so I had a long list of requirements for our new bed. I knew I wanted something similar to the tufted mattress I had but I wanted something a bit more durable and budget-friendly. Also, it couldn’t be quite as tall (though I LOVE tall headboards) because it wouldn’t fit up our stairs (boo!). I decided to go with velvet because it would be forgiving and easier to spot clean than most materials. Linen was too easy to stain for example. 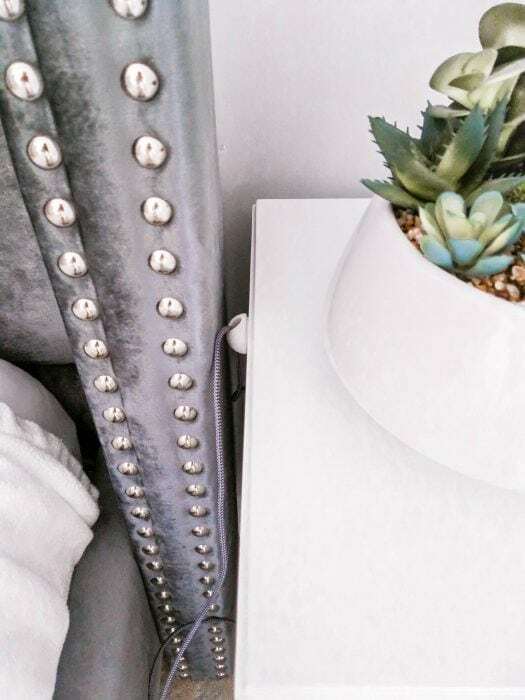 Leather would be ideal but I’m not a big fan of tufted leather and it would be so expensive! So velvet it is! Velvet can be tricky though… too thick and it seems cheap. It needs to be just the right type of velvet so that it’s soft without giving our parents flashbacks to the 70’s! I also knew that I wanted a complete bed, not just a headboard so that I could tuck the blankets in on the sides and get that clean look. 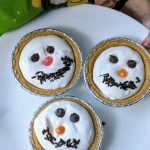 The draped comforter was nice and cozy for a while but the room always looked messy, my kids loved to pull on it, and it never seemed to stay put at night! It also had to be flexible! It had to come with slats (because I wouldn’t be using a box spring) but I also wanted the slats to be removable so we could put an adjustable base inside the bed in the future if we decided to go that route (it’s not in the budget right now). That’s a long list of requirements right? Oh, the other weird requirement… I didn’t want any “crystals” in the tufting. I know this may seem like a weird thing to point out but SO many of the beds I found that seemed perfect had crystals. Anyway… I found THE perfect bed! 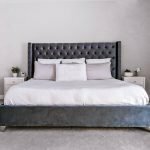 This bed is from Wayfair and it met all my criteria! How do you like it? I love the softness of the velvet and how forgiving and easy to clean it is! The base comes up just high enough that I can easily tuck the comforter in so that it’s neat and holds the blanket in place. PLUS, since the edges of the bed have a fabric cover all around, the edges and corners aren’t quite as dangerous for a little while as he learns to walk and cruises around the bed! YES, the edges are still hard, but no very sharp corners to worry about! Very kid friendly! 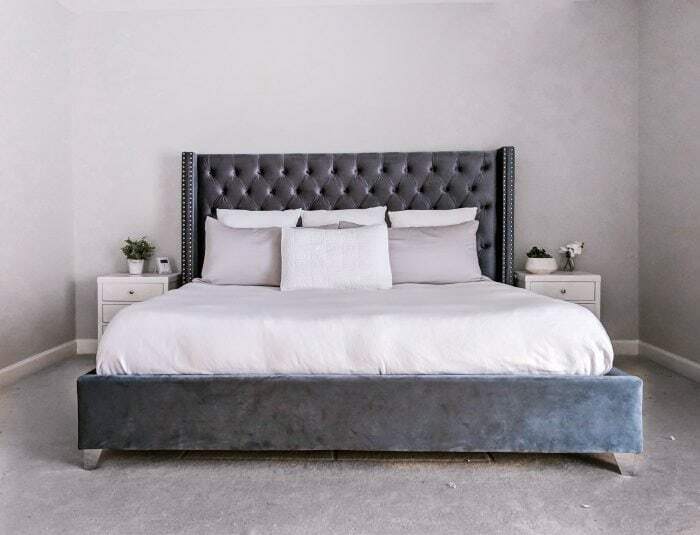 You can get this bed from Wayfar by clicking here. 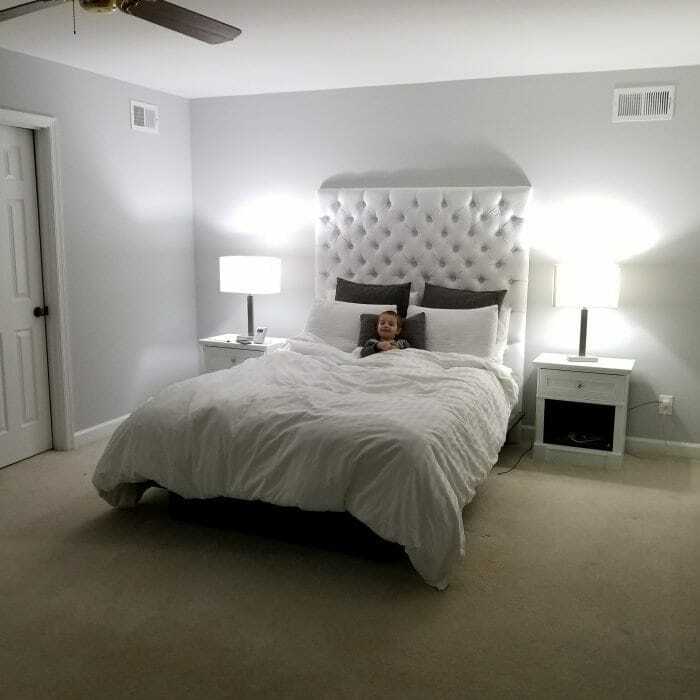 At under $600 this bed is an AMAZING deal! Similar beds I’ve seen cost well over $1000! So I already said that I couldn’t wait for the mattress… but really you don’t know how obsessive I was about it! The moment it arrived, my husband and I got it upstairs and opened it! Our bedframe hadn’t even arrived yet, and the room was a mess because of the renovation going on in my bathroom (that’s a topic for another post!). But we opened it anyway and I immediately plopped down on it to take a cat nap! My god, it was so comfortable! It’s cool to the touch and actually softer than I had expected. We then took turns throwing ourselves on it… I mean why not, it was on the floor right? I felt like a little kid but it was fun. Let me tell you… when they say that there is no motion transfer, they aren’t kidding! My husband weighs a lot more than me and when he threw himself on our Purple Mattress, I didn’t budge an inch! This is especially great because I swear my boys never “roll over”… they some how throw themselves from stomach to back and vice versa. I can’t even mimic it and yet they all do it! It must be genetic. With our old mattress, I get thrown around by the shear force of it… so nice to not have that anymore! Want to try Purple? 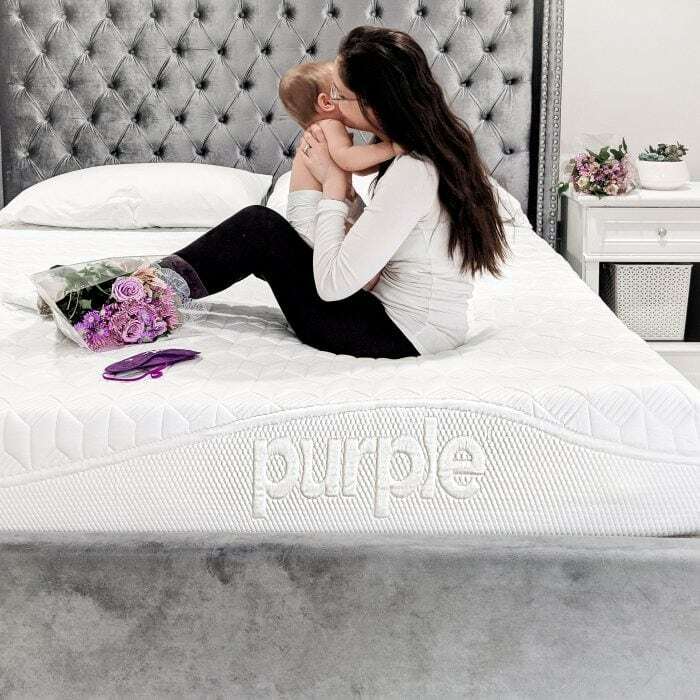 If you click HERE and buy a Purple Mattress we will both get a $50 Amazon Gift card! You can use the $50 Amazon gift card on ANYTHING and that’s on top of any deal they are having! One thing I didn’t know beforehand was that you need certain sheets with this mattress. Did you know that? So… of course, I got jersey sheets because what’s the point of having an awesome mattress if it’s going to be limited by my sheets?! The problem is, jersey style sheets stretch out so badly and the bed constantly feels messy! So I tried Purple brand sheets. These have “give” or stretch too but are made of Bamboo and OMG what a difference! They are the softest sheets I’ve ever tried and even though they are stretchy, they don’t completely stretch out of shape as my jersey sheets do! It’s like some sort of crazy magic! If you get a Purple mattress, then I highly recommend getting their sheets too! Luckily, it seems that they often give you a “freebie” when you purchase a mattress. Just watch out for the sales and you can probably get a set of their sheets for free with the mattress! I also found an AMAZING deal on nightstands on Wayfair. I’ll start by saying that I try really hard to buy solid wood furniture when I can. 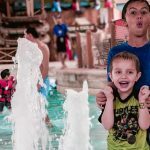 It’s often a bit more expensive and options are more limit but when you have kids, it’s so important. Simple! Kids will bang things against your furniture and destroy it! Especially if they love things like cars and trains… Those little Thomas and Friends trains will do some damage on your furniture – trust me! If you get solid wood though, you can refinish it anytime! I have a kitchen table that I have sanded down and restained and repaired multiple times now and it will last FOREVER! 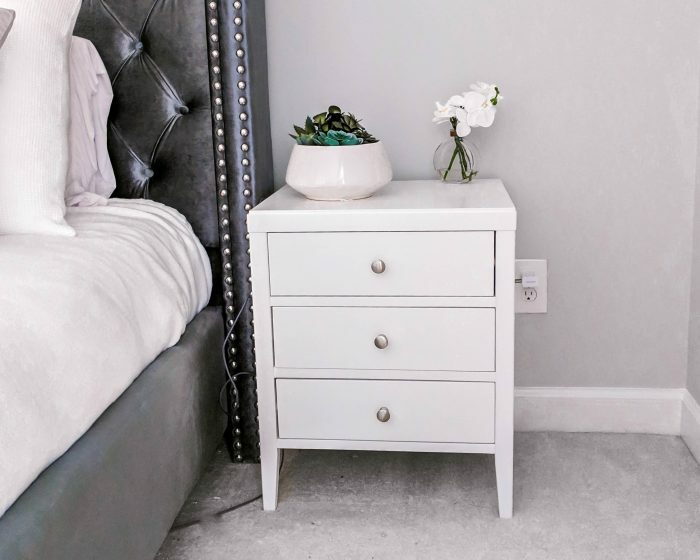 Long story short – I found the cutest minimalist nightstands on Wayfair that are solid wood AND cost only $120 each! For solid wood furniture that is an amazing deal! I liked these because of the clean lines, simple design, and convenience of the 3 drawers! With the drawers, I can store things like diapers and wipes within reach without worrying that it will look messy. 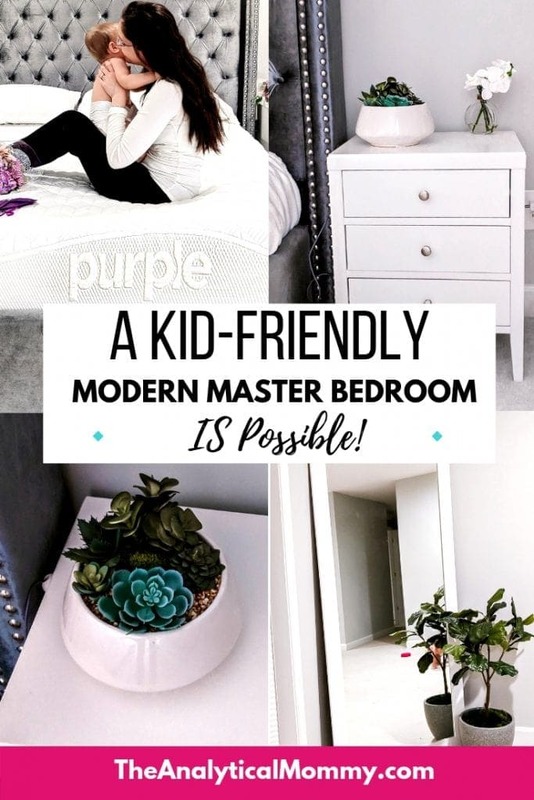 I’ll admit that I was drawn to nightstands with only one drawer or the little cubby but those simply aren’t as convenient with kids around! Kids loves to pull things out of cubbies and one drawer just wasn’t enough! I plan to add drawer locks to these nightstands to “baby proof” them but haven’t done so just yet. Many people have recommended these so I’ll probably install them soon! I did change the little nobs though so that they’d match the hardware in the rest of my house. I do this with any furniture I get though just to make it a bit unique and to make the look cohesive! To help keep the nightstand surface nice and neat, I got these sticky cable grips that I attached to the side the nightstand (you can see it on the left above) so that my cell phone charger will always be within reach by off the surface! You can by them here on Amazon. They are really really cheap and come in a great variety pack! No picture perfect room would be complete without a beautiful mirror and a pop of color right? I had a small mirror before that also doubled as my jewelry case but it was too small and my husband and I were always trying to use it at the same time every morning! Plus kids LOVE mirrors right? I opted for a clean modern oversized mirror from Wayfair and decided to sit it on the floor. This is the one I picked. Isn’t it pretty? This piece was a bit of a splurge item for me. 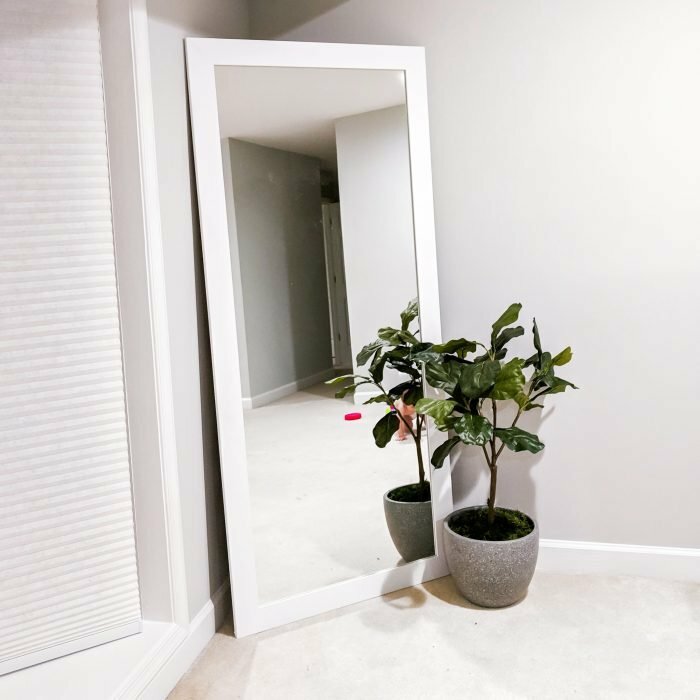 Compared to the other deals I got, this one cost a bit more than I had hoped but it was well worth it and about half the price of other similar mirrors! I got this one from Wayfair for a little over $200. Click here to see more. The only problem is.. this mirror would be deadly if it fell on a kid! So I got some amazing furniture anchors to keep it in place! Now this mirror won’t fall on anyone! On that subject … Let this be a reminder to please please secure your furniture, TVs and anything else that could tip or fall. Please!! Here are the anchors I used. I got them on Amazon and my husband installed them easily! I also got a faux plant to tie it all together. While I love the clean gray and white, a little pop of green around the room makes this minimalist design feel like home! I hope you love it as much as I do! Comment below worth any suggestions or questions you might have about any of the items! I know it can be scary to buy home decor online but I love what I got! To learn more about the items I’ve mentioned, click on any of the images below!